The first time I remember sitting at a sewing machine, I was probably 7 or 8. I sewed a tank top and pair of shorts for a 4-H project. I hated it. The process was long and frustrating. The final product was not soft or stretchy like store-bought clothes. I swore off all sewing. Fast forward to my adult years. In 2010, a friend had a baby, and I felt the need to make a quilt (who knows where that inkling came from!). I had a hand-me-down sewing machine from my mom "just in case" I needed to sew something. Once I got started, I quickly realized the cheap sewing machine was not going to cut it. I did lots of research and bought a vintage Bernina Record 930. Whenever I had a quilting question, I called my mom, Googled it, then watched a YouTube video. The quilt didn't turn out too bad, and as they say, the rest is history! Both of my grandmothers quilt, as does my mom. My maternal great grandfather was a Singer sewing machine repairman. My grandmothers both like to quilt by hand (they piece by machine). My mother pieces and quilts by machine, but prefers to bind by hand. However, I do everything by machine. If it can't be done by machine, it most likely won't get done! I stay at home and homeschool our three young boys. Quilting is to me what fishing is to my husband. It keeps me sane. I also love creating a tangible thing that will provide joy and warmth to others. Most work as a mother and teacher is intangible, so I like that quilting results in something to show for the work put in. I love trying new things and rarely make the same thing twice. My style is eclectic. I make modern quilts, traditional quilts, and quilts in-between. 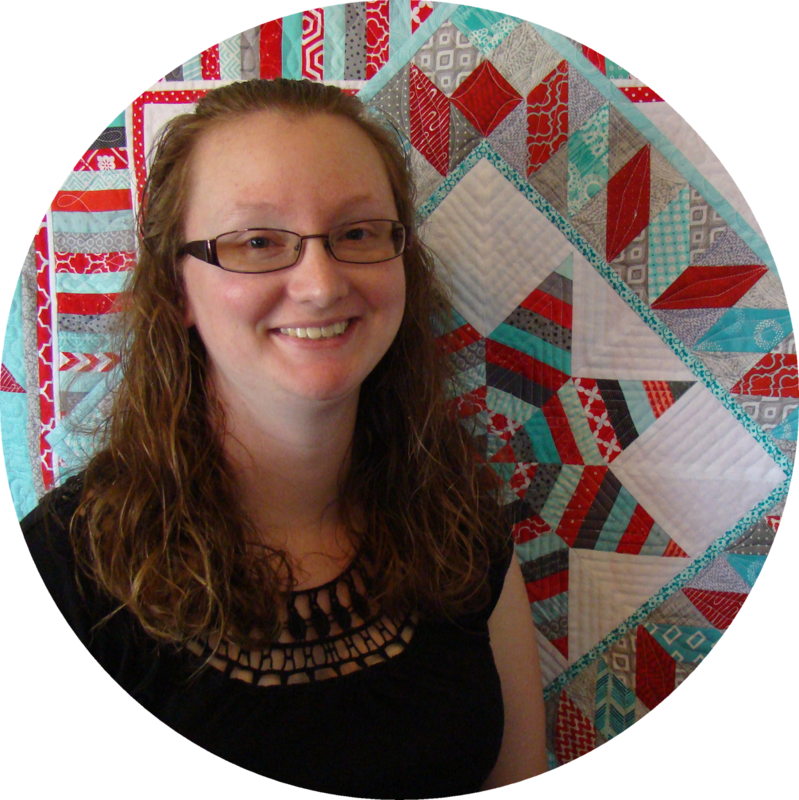 I make large quilts, mini quilts, and all sizes in-between. I occasionally sew other items, but you'll mostly see me working on a quilt. 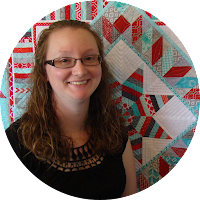 The online quilting community helped me start quilting (and love it! ), and I'm so grateful to be a part of it now! Please take a look around and leave a comment. I'd love to get to know you, too! Want to collaborate? Email me at sliceofpiquilts (at) gmail (dot) com. I love your quilt there very inspiring. As a beginner sewer its a little intimidating. I dont think that im at the level to start one but hopefully soon ill be. Do you have any tips for a beginner? Read your article on mounting a laser on your sewing machine. I'm trying to understand how the laser beam goes down, and then sends the beam along the throat plate out in a straight line on the sewing line. I've never known a laser beam to bend, so I'm trying to understand how that works. Can you explain that to me please? Just purchased your Bookends Mini quilt pattern at Mancuso Quilt Show in Manchester, NH. Before I begin I would like to know if there are any corrections, additions etc. to this pattern. Thanks for reaching out! The pattern has not had any corrections or changes. I'd love to see your quilt once you finish! will you be doing the donkey quilt? I'm working on the pattern this week! I loved how you downsized your pattern from Text It! Smart cookie!